Just a few weeks ago, we treated a dog who had ingested toxic mushrooms. We think this is an excellent case to share with our readers right now given all the mushrooms that are popping up from so much rain. Even more importantly, this story is a great example for people to learn from because once the owners realized what had happened, they took all the appropriate steps to try and help their dog. 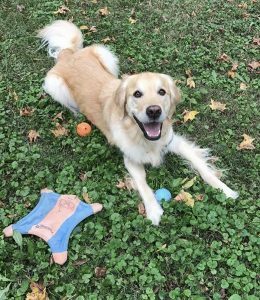 On Saturday, August 25, 2018 at 9:45 AM, Riley’s owners let Riley out into the yard for about five to ten minutes. Riley then came in and ate breakfast. Within about ten minutes, Riley vomited his food back up. The owners noticed several mushrooms in the vomit as well. Riley vomited two more times but no more mushrooms were produced. Within less than an hour of the mushroom ingestion, Riley arrived at Lawndale Veterinary Hospital. Dr. Burnett immediately examined Riley and induced vomiting with a drug called apomorphine. Riley vomited some more, but no additional mushrooms came out. Dr. Burnett then administered a drug called Cerenia to help Riley not feel nauseous anymore. Bloodwork was performed as a baseline screening and everything was found to be normal. Activated charcoal was also administered as a way to help bind any toxins that may still be in the gastrointestinal tract. 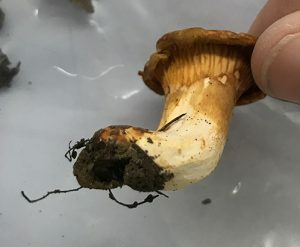 It was not immediately clear what type of mushrooms had been ingested based on visual examination of the mushrooms in the clinic. We knew that it was highly probable that Riley had at least ingested a mushroom toxic to the gastrointestinal tract because of how he vomited so quickly after eating the mushrooms at home. Since we did not know whether the mushrooms were a more toxic species that could impact the liver or even lead to death, Riley was also placed on supplements to protect the liver. Riley was discharged later that morning. Riley did great through the weekend eating a bland diet and taking a gastrointestinal protectant (in addition to the liver supplement). The owners monitored Riley closely for any further problems or symptoms. On Monday (two days later), the owners brought Riley back to the clinic for us to recheck bloodwork. Even though Riley was still feeling great and there had been no further vomiting, we needed to make sure that there had not been any toxic effects of the mushrooms on internal organs. Thankfully the bloodwork looked great and Riley has been fine since! In a previous blog last fall (Poisonous Mushrooms), we discussed how mushroom identification can be tricky. The mushrooms in this case were taken to a mushroom enthusiast for possible identification. Upon careful examination of the mushrooms that had been vomited, they actually appeared to be a separate species from the uneaten mushrooms that had been collected from the yard. From visual examination it could be concluded that the mushrooms were not the highly toxic Amanita species, but they were likely to be in a group of mushrooms that can be toxic to the gastrointestinal tract (which explained Riley’s acute vomiting). Spore prints were attempted on the mushrooms from the yard, but the mushrooms had already shriveled too much to generate an adequate spore print. Spore prints could not be made of the mushrooms from the vomit. Mushrooms are fungi (mold). The spores are all over the yard unseen. When conditions are right (e.g., moisture, humidity) mushrooms can appear in a short period of time. Consider all mushrooms toxic and don’t allow your pet to ingest them if you can prevent it. If you see mushrooms coming up in the yard, remove them or keep your pet away from that area so your pet will not be tempted to eat the mushrooms. Of course, accidents can happen. If your pet does ingest mushrooms, get your pet to the veterinarian immediately. While some mushrooms are non-toxic and others can cause limited symptoms of toxicity, there are some species that can be deadly. Swift action can save your pet. Identification of mushroom species often involves multiple steps, including understanding where the mushroom was growing (On the ground? On the side of a tree? In a field? In the woods? ), visual examination, spore printing, and microscopic examination of the spores. When collecting mushrooms for examination, collect the entire mushroom. This includes the base, which could be underground. Try and preserve the mushroom structure as much as possible. Place the mushrooms in a paper bag, cardboard box, or wax paper. Avoid using plastic bags because mushroom decomposition can speed up in plastic bags, making identification difficult to impossible.